Q When you pulled down to the Rockingham gate, you say you looked down the driveway? Q Would that mean, sir, that your driver's side window was parallel to the driveway? Q And so you were right next to this area here that I'm indicating with my pen, which is just above the line that seems to indicate the edge of the driveway uppermost on the Rockingham side? Q Now, why were you looking up that driveway, for what purpose? A To drive into it. Q And why did it seem inaccessible to you? A It just seemed too narrow. The two walls here, and just the way the cars were and the way the driveway bent this way, it didn't look as easy as the other side, as coming in straight ahead and then making the turn. A He came towards me and opened the gate. I drove in. Q Can you tell us where you parked the car? A I parked it right in front with the driver's side window parallel to the front door. A I popped the trunk and got out. Q Did you notice whether anything was outside the front door? A Yes. There was a couple bags on the ground. A Just black duffel bags. Q Did you notice whether there were any other bags outside? A There was another one laying back towards the garage area, towards the back of the two cars that were parked in there. Q Were there cars parked in the driveway? A From what I remember, yes. A There was two parked right here. Q Do you remember what kind of cars they were? A I know one was a Rolls Royce, and the other I couldn't tell. Q Which one was closest to the house? A I can't remember that. Q You can't remember whether it was the Rolls or the other one? Q Could you put two C's where you think the cars were parked on the driveway. Where in relationship to those two cars did you see the other bag? A It was back here about on the ground. Q Was it on pavement or was it on grass, if you know? A From what I remember, it was on the driveway. Q Could you put a 'B' where you think you saw that other bag? 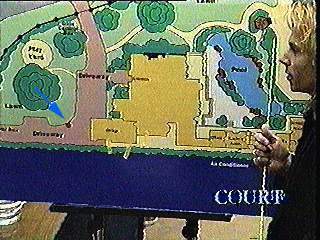 MS. CLARK: And for the record, the witness has placed two C's where he indicated "car" on the driveway, which would be by the gate that opens on Rockingham, and he placed a 'B' just to the right of the second 'C'. Q NOW, MR. PARK, YOU HAD DESCRIBED FOR US I BELIEVE YESTERDAY HOW WHEN YOU PULLED TO THE ROCKINGHAM GATE YOU LOOKED INTO THE DRIVEWAY THERE AND ONE OF THE THINGS YOU WERE TRYING TO CONSIDER IS WHETHER OR NOT THE LIMOUSINE COULD BE PULLED IN THROUGH THE ROCKINGHAM GATE; ISN'T THAT CORRECT? 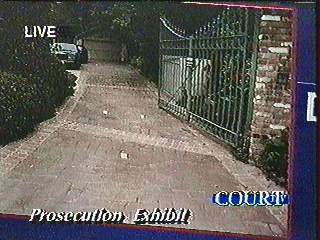 Q AND YOU HAVE PREVIOUSLY TESTIFIED THAT YOU DID SEE TWO CARS IN THAT DRIVEWAY? Q AND ARE YOU SURE ABOUT THAT? A I'M PRETTY SURE. NOT POSITIVE, BUT THAT IS WHAT I OBSERVED. Q ALL RIGHT. YOUR BELIEF IS YOU SAW TWO CARS THERE? Q CAN YOU DESCRIBE THOSE TWO CARS FOR US? A THE ONE I KNOW WAS A ROLLS ROYCE. THAT IS SOMETHING THAT IS PRETTY OBVIOUS. THE OTHER ONE I WASN'T TOO SURE ABOUT; ANOTHER DARK CAR. Q ALL RIGHT. AS YOU WERE FACING LOOKING IN THE ROCKINGHAM GATE, WHICH OF THE TWO CARS WOULD BE -- WOULD BE CLOSEST TO YOU, SIR? A FROM WHAT I REMEMBER, THE ROLLS ROYCE. Q ALL RIGHT. AND SO WOULD YOU ACCEPT THAT THAT MIGHT BE A BENTLEY AS OPPOSED TO A ROLLS ROYCE? SAME FAMILY? Q ALL RIGHT. IT WAS DARK IN COLOR; IS THAT CORRECT? Q ALL RIGHT. NOW, DID YOU HAVE OCCASION TO SEE SOME PHOTOGRAPHS OR SOMETHING AT OR ABOUT THE TIME THAT YOU TESTIFIED AT EITHER THE GRAND JURY OR THE PRELIMINARY HEARING WHERE YOU SAW TWO CARS IN THE DRIVEWAY AT SOME POINT? Q ALL RIGHT. IF I WERE TO TELL YOU THAT THAT SECOND CAR DID NOT ARRIVE IN THAT DRIVEWAY UNTIL ABOUT ONE O'CLOCK P.M. -- ONE O'CLOCK A.M., WOULD THAT IN ANY WAY REFRESH YOUR RECOLLECTION THAT THERE WAS ONLY ONE CAR THERE WHEN YOU LOOKED IN THERE? Q YOUR BEST RECOLLECTION AS YOU SIT HERE NOW IS THAT YOU SAW TWO CARS WITH THE BENTLEY OR ROLLS ROYCE PARKED FIRST; IS THAT CORRECT? Q ALL RIGHT. AND THE SECOND CAR THEN, WHAT KIND OF CAR WAS THAT? A I DON'T KNOW WHAT KIND OF CAR IT WAS. IT JUST SEEMED TO BE ANOTHER DARK CAR. Q ALL RIGHT. DARK IN COLOR? Q AND YOU BELIEVE THAT THAT SECOND DARK-COLORED CAR WAS PARKED BEHIND THE BENTLEY? YOU SAW THE BENTLEY THAT PARTICULAR NIGHT, SIR? Q NOW, THIS OTHER CAR, THIS OTHER DARK CAR, DO YOU RECALL WHERE THAT CAR WOULD BE IN RELATIONSHIP TO THE -- TO THE BENTLEY? MR. COCHRAN: ALL RIGHT. AND SO WE MAY EITHER MAKE A VERY SMALL CAR OR RUN INTO THAT OTHER "B," BUT RIGHT BEHIND IT? MR. HARRIS, CAN YOU DO THAT? Q RIGHT IN THAT AREA THERE, (INDICATING)? Q ALL RIGHT. THAT IS THE ONE YOU ARE NOT POSITIVE ABOUT, RIGHT? THE COURT: WELL, MR. COCHRAN, I REALLY DON'T THINK IT IS NECESSARY TO MARK IT. THE JURY HAS BEEN THERE; THEY HAVE SEEN IT. MR. COCHRAN: ALL RIGHT. THAT IS FINE. THE COURT: THEY KNOW WHAT WE ARE TALKING ABOUT. MR. COCHRAN: FINE. NO PROBLEM THEN, YOUR HONOR. SO WE KNOW THE AREA. CAN YOU SEE PEOPLE'S 136 FOR IDENTIFICATION THERE? Q BY THE WAY, HAVE YOU EVER SEEN THAT PARTICULAR PHOTOGRAPH BEFORE? Q AND COULD YOU HAVE SEEN THAT PHOTOGRAPH IN MISS CLARK'S OFFICE? Q AND WE HAVE ALREADY COVERED THE FACT THAT YOU ARE CLEAR ABOUT THE BENTLEY, BUT NOT SO CLEAR ABOUT THE CAR BEHIND, RIGHT? Q AND DOES THAT PHOTOGRAPH COMPORT WITH YOUR PRESENT RECOLLECTION OF HOW THE CARS WERE CONFIGURED THAT NIGHT WHEN YOU WERE LOOKING INTO THE ROCKINGHAM GATE? Q NOW, WITH REGARD TO THE STRETCH LIMO, AS I UNDERSTAND IT, IN ORDER FOR YOU TO COME OUT THE ROCKINGHAM GATE, YOU WOULD HAVE TO COME RIGHT DOWN THE DRIVER'S SIDE OF THOSE TWO CARS DEPICTED IN PEOPLE'S 136 FOR IDENTIFICATION; IS THAT RIGHT? 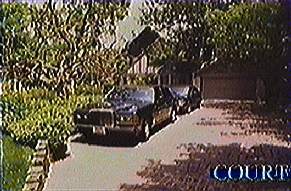 Q AND DO YOU KNOW, AS YOU LOOK AT THAT PHOTOGRAPH, IN RECALLING THAT PARTICULAR DRIVEWAY, WHETHER IT WOULD HAVE BEEN POSSIBLE TO MANEUVER THAT STRETCH LIMOUSINE AROUND TWO CARS AS THEY ARE PARKED AND CONFIGURED THERE? A I WOULDN'T KNOW THAT. Q YOU DON'T KNOW THAT, DO YOU? Q DO YOU AGREE IT WOULD BE A LOT EASIER IF THAT SECOND CAR WASN'T THERE, TO GET OUT OF THAT DRIVEWAY; ISN'T THAT CORRECT? MS. CLARK: OBJECTION. CALLS FOR SPECULATION. CAN YOU TELL FROM THAT PICTURE? Q BY MR. COCHRAN: ALL RIGHT. WELL, LET ME ASK YOU THIS WAY: WITH REGARD TO THE WAY THE CARS APPEAR THERE, YOU CAN'T TELL WHETHER IT IS POSSIBLE TO MANEUVER THE STRETCH LIMOUSINE AROUND THEM; ISN'T THAT CORRECT? A FROM THAT PICTURE, NO. Q HOWEVER, YOU WOULD AGREE, WOULD YOU NOT, THAT IF THERE WERE ONLY ONE VEHICLE THERE IT WOULD TEND TO BE EASIER TO GET AROUND THERE WHERE YOU HAVE TWO VEHICLES PARKED IN TANDEM; ISN'T THAT CORRECT? Q AS WE SIT HERE NOW, DOES THAT PHOTOGRAPH, PEOPLE'S 136, IN ANY WAY REFRESH YOUR RECOLLECTION OF WHETHER OR NOT THERE WERE ONE OR TWO CARS THERE ON JUNE 12TH IN THE LATE EVENING HOURS? Q I'M GOING TO ASK YOU IF THE QUESTIONS I'M ABOUT TO READ TO YOU AND THE ANSWERS ARE THOSE YOU RECALL BEING POSED TO YOU AND GIVEN BY YOU AT THE PRELIMINARY HEARING IN I BELIEVE IT WAS JULY OF 1994. "QUESTION: SO WAS IT ABOUT 10:39 WHEN YOU PULLED DOWN TO THE ROCKINGHAM GATE? "ANSWER: YES, I WOULD SAY THAT. "QUESTION: WHEN YOU PULLED DOWN TO THE ROCKINGHAM GATE, YOU SAY YOU LOOKED DOWN THE DRIVEWAY? "QUESTION: WOULD THAT MEAN, SIR, THAT YOUR DRIVER'S SIDE WINDOW WAS PARALLEL TO THE DRIVEWAY? "QUESTION: AND SO YOU WERE RIGHT NEXT TO THIS AREA HERE THAT I AM INDICATING WITH MY PEN, WHICH IS JUST ABOVE THE LINE THAT SEEMS TO INDICATE THE EDGE OF THE DRIVEWAY UPPERMOST ON THE ROCKINGHAM GATE?" MS. CLARK: ROCKINGHAM SIDE, THANK YOU. "NOW, WHY WERE YOU LOOKING UP THAT DRIVEWAY? FOR WHAT PURPOSE? "ANSWER: TO DRIVE INTO IT. "QUESTION: AND WHY DID IT SEEM INACCESSIBLE TO YOU? "ANSWER: IT JUST SEEMED TOO NARROW, THE TWO WALLS HERE AND JUST THE WAY THE CARS WERE AND THE WAY THE DRIVEWAY BENT THIS WAY, IT DIDN'T LOOK AS EASY AS THE OTHER SIDE AS COMING IN STRAIGHT AHEAD AND THEN MAKING THE TURN. "QUESTION: SO IT LOOKED A LITTLE BIT TOO TIGHT TO GET UP TO THE FRONT DOOR FROM THAT GATE? "SO YOU WERE LOOKING CAREFULLY THROUGH THAT WINDOW TO ASSESS WHETHER OR NOT YOU COULD MAKE THE TURN? Q YOU WERE ASKED SOME QUESTIONS ON REDIRECT EXAMINATION BY MISS CLARK REGARDING THE LOCATION OF THIS SMALLER BAG THAT WAS SOME TWENTY FEET AWAY FROM YOU. DO YOU RECALL THAT? Q AS YOU THINK BACK IN YOUR MIND'S EYE, CAN YOU TELL US HOW FAR THAT SECOND BAG WAS AWAY FROM THE SECOND CAR, IF THE SECOND CAR WAS THERE? MS. CLARK: OBJECTION. THAT IS CONFUSING, VAGUE. THE COURT: DO YOU UNDERSTAND THE QUESTION, SIR? Q BY MR. COCHRAN: YOU MAY ANSWER. A IT -- IT SEEMED TO BE THREE TO FIVE FEET BEHIND THE BACK BUMPER. A OF THE SECOND CAR. Q IN OTHER WORDS, SO IF WE -- IF WE COULD PUT THAT DIAGRAM UP, IT WOULD BE BEHIND WHERE YOU BELIEVE THE SECOND -- THE BACK BUMPER OF THE SECOND CAR? Q NOT THE BENTLEY; IS THAT RIGHT? Q. All right. And what does the B stand for that's on the exhibit that's on the Elmo, sir? A. That's for the bag. Q. And you said that there was a bag right in the area where the B was, true? Q. And you also testified, after being in the area for 20 to 25 minutes and noting with specificity where the bag was; that there were two cars parked in the cut-out area, did you not? A. That's what I observed. Q. If fact, there were not two cars there on that night, were there? A. I still don't know. Q. Well, was it your understanding, sir, that of the purported two cars that were in that cut-out area on the -- well, strike that. When you left you drove right by the cars, car or cars, that were in the cut-out area before you left, didn't you? Q. And in other words, your vehicle was parked going south and you drove out the Rockingham gate and then proceeded up Rockingham right past these purported two vehicles that were -- that were allegedly parked there, right? Q. And in your recollection of the events of that evening, those recollections came after you had spent some hours with Ms. Clark and seen pictures of the vehicles that were parked in the driveway; isn't that true? Q. Is it your recollection that there was a Saab convertible parked as the back most vehicle when you say that you were there on June 12, 1994? A. I never said what type. Q. I'm asking you, sir, is that the type it was, or do you have a recollection of that at all? Q. You have a recollection of exactly where this bag was purportedly placed? Was it placed behind a Bentley, was it placed behind a Saab, was it placed behind some other type of vehicle, or is it possible you don't have a clear recollection of that at all. MR. PETROCELLI: Misstates his testimony. He didn't say anything about exactly, Your Honor. It's argumentative and compound. A. It was behind a vehicle. Q. (BY MR. BAKER) Well, as you sit here now, you have no recollection of what type of vehicle, how far it was behind, and what color it was, right? A. That's correct. Didn't care. Q. (BY MR. BAKER) Now, Mr. Park, the B is for the bag that you say you noticed when you were about 20 feet away from it; is that right? Q. And you believe that bag was behind the second car that was parked over there in the cut-out area, correct? A. It was behind the car, yes. Q. It was behind the second car, was it not?